I am 31 weeks into my pregnancy and have reached that point where my life feels like one big boring waiting game. I try to keep busy organizing the house and cooking freezer meals, but I lack the energy and inspiration to do much of anything else, making life incredibly boring. The nesting bug has yet to hit and I am having trouble dealing with all the things I can’t do right now. I have always been a planner, but I am sick to hell with planning. I have plans galore, I just don’t have the energy or inspiration to put my plans into action. So most everything is on hold for now and that’s driving me nuts. I try to relish those enjoyable pregnancy moments like when I feel the baby kicking up a storm. It’s the most amazing feeling. There is a human growing in my belly and I can feel his knees with my fingers. I can feel him push back in response to my pokes. Wow. Incredible. At the same time I can’t help but sadly wonder if this will be the last time I will get to feel this. Tom and I haven’t decided on whether this will be our last child or not. I could see myself having one more, but Tom isn’t convinced yet and frankly neither am I. So I am struggling with the thought that this could be my last and I should enjoy every uncomfortable moment. I have to admit, I am getting tired of telling myself to enjoy these last few calm weeks. Soon I will be crazy busy with the new baby, Brae’s school and then the holidays right after that. I will be wishing life was boring. Such smart advice, but so hard to do. Like I said before, one of the things I have been doing is cooking and preserving food. Since my garden is barely producing enough for our day to day life I have been focusing my efforts on preserving as many apples and blackberries as possible. My preferred method of preserving blackberries is by freezing. Frozen blackberries can be substituted for fresh berries in almost any recipe and are vital to the breakfast smoothies I drink all winter long. All you need is a strainer, a cookie sheet and a flat space in your freezer. You can use this process with any berry so feel free to substitute. 1. 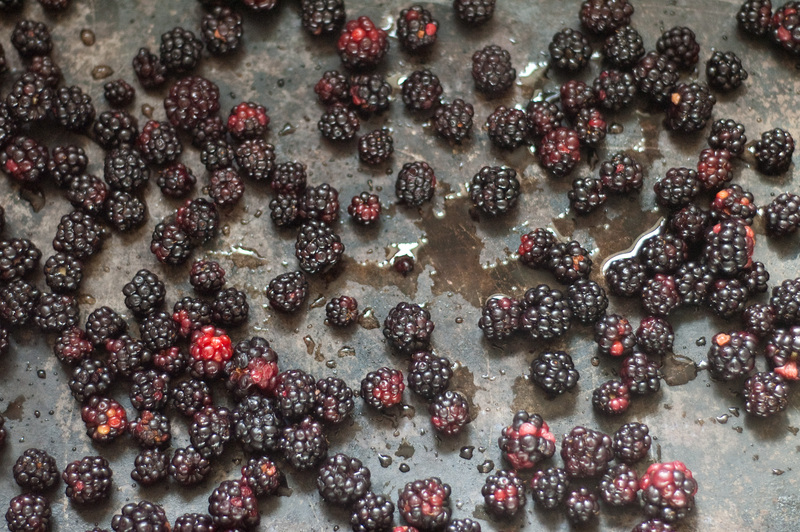 Remove stems and stray leaves from your berries. Rinse berries in small batches in a strainer for a couple of minutes, swirling the berries around to remove all dirt and bugs. Let drain for a minute or two. 2. 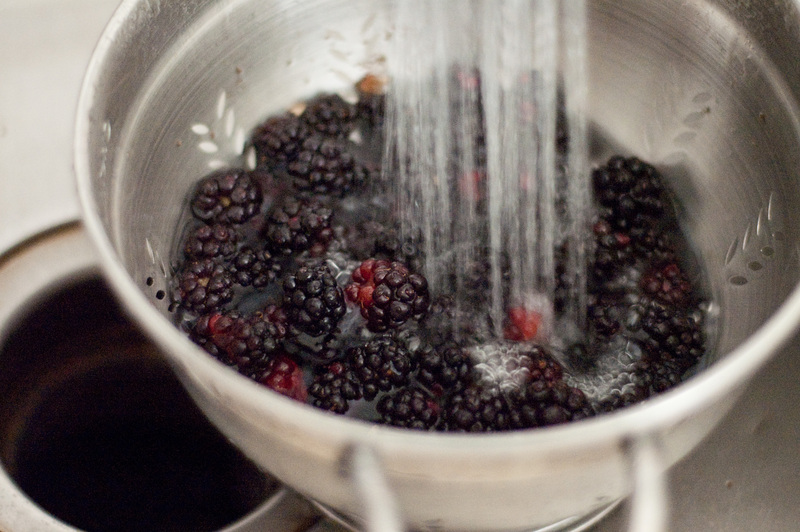 Pour berries onto a cookie sheet and blot up any extra water with a paper towel. That way they won’t stick to the tray as much when frozen. When all the berries are rinsed and on the tray lightly shake the tray to spread the berries out in a single layer. Its best if your berries have a little room between each other so they don’t stick together. 3. Place the tray of berries in the freezer making sure the tray lays flat. Berries will be sufficiently frozen in about 3 hours, but I do the next step whenever I have an extra 5 minutes. 4. When frozen, remove tray from the freezer and carefully unstick them from the cookie sheet with your fingers. Put them in a freezer safe ziplock bag, press out all the air and close. Label with the month and year. 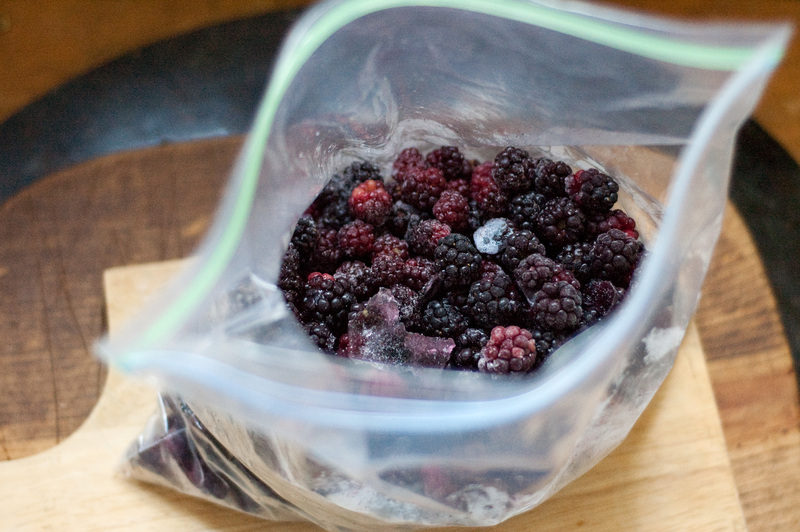 Since berry seasons are fairly short you can freeze the berries in small batches and continue filling the bag until berry season is over or until you need to start a new bag. The trying to decide if your family is complete part is hard. I want two but I hate pregnancy SO much that it looks like one is it for us. But how cool to feel him poking you back 🙂 Definitely enjoy that part. I’m certainly not going to enjoy the bits where I feel like a zombie just because I’m supposed to! I wonder if Dave will push my heavily pregnant body up the hill where the blackberries grow this summer 😉 That would be a sight to see. I was just saying last night that I would love to plant some blackberries at the farm. We freeze from our garden and buy local fruit too to freeze, but there is nowhere local to buy blackberries and raspberries in bulk.